The Psychology of Money: Do We Spend Our Money on What Matters Most? Does Your Thinking Limit Your Success? 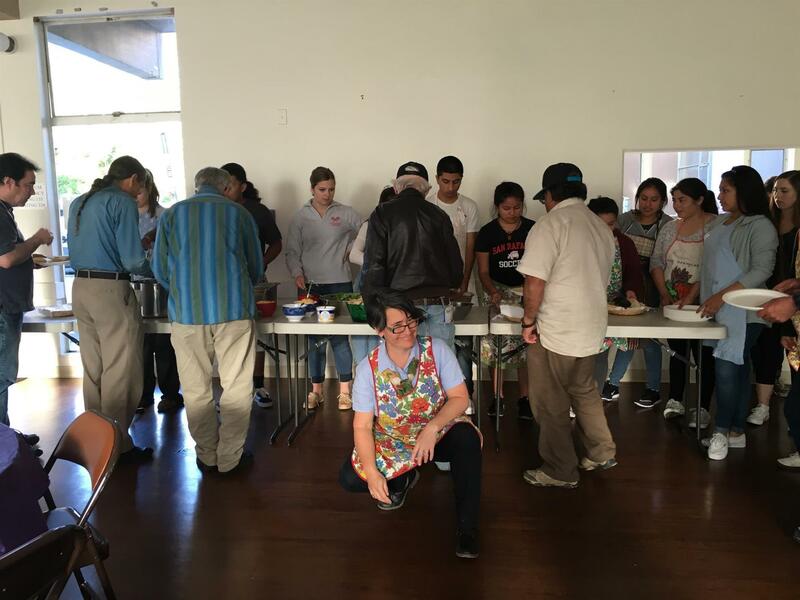 This week the Interact students of San Rafael High School bought, cooked, and served the homeless an evening meal. 1. Kramer Herzog returned from 2 months of physical rehab from his skiing accident and from travel to Hawaii where his latest video, for the Kids of Paarl, won top prize. . BELL RINGER Kramer also brought Bev a President's Gift, Hugh a President-Elect gift, and Carola a President-Elect nominee gift from Hawaii! Cindy Stameroff, CPA and Kris Edwards, CPA, both offered bell ringers because tax season is over! Your scribe may have missed other "good news" from April because I cannot find my notes for the later meetings. 2. Chris Major announced his Chess Club is finishing up in one school and he is about to volunteer to teach Chess for a week at Bahia Vista. 3. Judi Cooper paid a birthday fine, and 4. Stacie Strassberg paid a fine because she had a great experience singing at Open Mike Night. 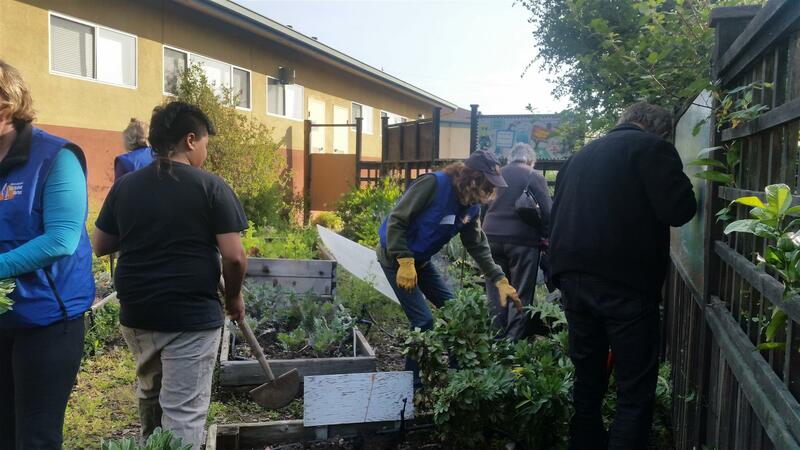 We worked at Davidson Garden instead of meeting at our regular Jackson Cafe and...wow! !...the garden is really thriving. 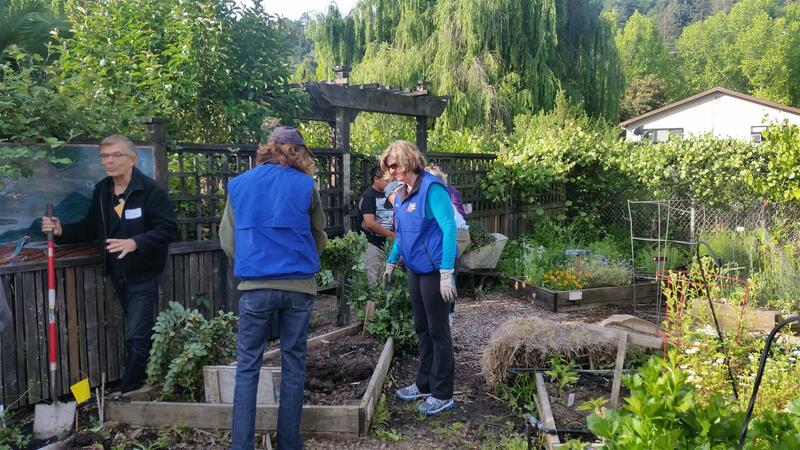 Lori Davis of Sanzuma described the progress toward full organic, sustainable gardening. Aaron, a sixth grade student, was there to help explain why celery tastes better from one bed than from the other beds. 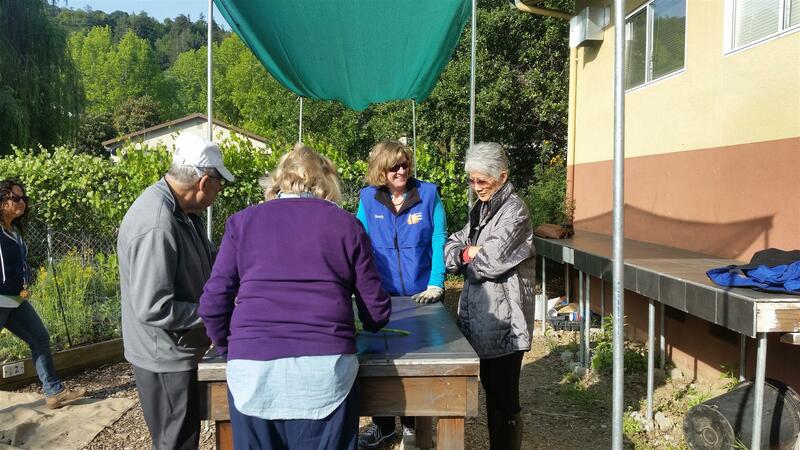 Then, some of us (your scribe excepted), rolled up our sleeves, stuck on our garden gloves, and pulled weeds and cleaned up. FUN!. 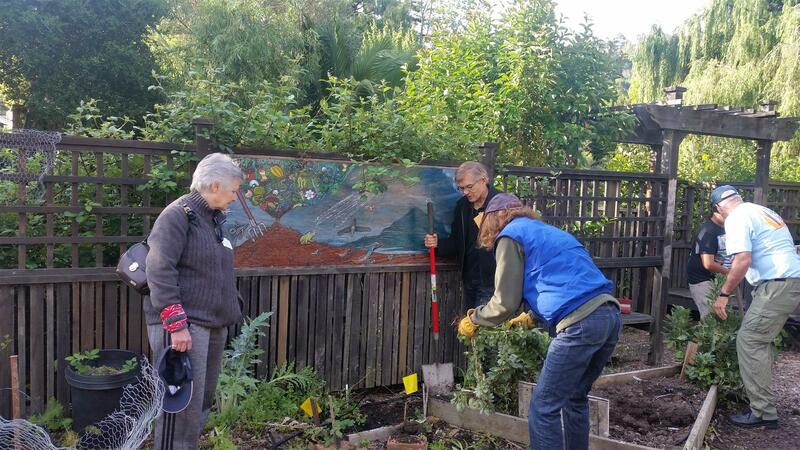 Carola Detrick, David Peters (shovelling now), and Jeffrey Allen pulling weeds. David Peters with the shovel, Cindy Stameroff (back to us) and President Bev Shwert. Aaron Hutchinson inspires 5k charity run and other options! We were inspired by speaker Aaron Hutchinson and happy to see his wonderfully successful 5K Color Run hosted by our own Marin County Rotary Club of Ignacio., in Novato. Fundraisers are always difficult to plan and having someone like Aaron in your corner seems very helpful. Greg Williams (Karen Hansen-Thompson's partner) went fishing with Jim Carriere and sent this shot out of Jim and his catch. KUDOS...another Jimbalya in the works?? ?